Edit 10/21/2011: Version 1.22/Generations is compatible with patch 1.26/Pets. Edit 8/1/2011: Version 1.22/Generations is compatible with patch 1.24/Town Life Stuff. Updated for patch 1.22/Generations. File has 1.22 in front of it. Compatible with Late Night EP and patch 6.0 and above. Those elevators sure take their sweet time going from floor to floor, don't they? 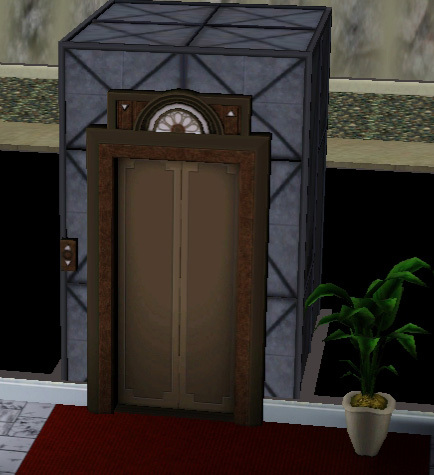 Well, as requested by a few people, here is the elevator mod! There are different flavors, slow, elevator (which is medium), fast and very fast. Only choose one! Elevators usually take around 10-15 sim minutes to go from floor to floor, depending on if sims get confused and whatnot. Well with the slow mod, it will take them around 20-25 sim minutes to go from floor to floor! Too slow for you? Well then try the elevator mod, that takes around 5-10 sim minutes to go from floor to floor! Not fast enough? Well the fast mod will take them 3-5 sim minutes! Still too slow? Try very fast, which will take them 1-3 sim minutes! Any faster and they might be flung out of the elevator! Note: Times may vary due to computers. On a high end/medium computer, these are what the stats are. On a very low end computer, I'm told it takes 30 sim minutes - 40 sim minutes without the mod, the slow one takes over half an hour in sim time, the elevator mod (medium) takes 25 sim minutes - 28 sim minutes, the faster one takes 10 sim minutes - 15 sim minutes (more like 15) and the very fast one takes 5 sim minutes - 7 sim minutes. But that's on a really low end computer that lags and doesn't play the game very well. elevatorslow.rar | Description: Elevator takes 20-25 sim minutes to go from floor to floor for 1.18/Late Night. elevator.rar | Description: Elevator takes 5-10 sim minutes to go from floor to floor for 1.18/Late Night. elevatorfaster.rar | Description: Elevator takes 3-5 sim minutes to go from floor to floor for 1.18/Late Night. elevatorveryfast.rar | Description: Elevator takes 1-3 sim minutes to go from floor to floor for 1.18/Late Night. 1.22elevatorfaster.rar | Description: Elevator takes 3-5 sim minutes to go from floor to floor for patch 1.22/Generations. 1.22elevatormedium.rar | Description: Elevator takes 5-10 sim minutes to go from floor to floor for patch 1.22/Generations. 1.22elevatorslow.rar | Description: Elevator takes 20-25 sim minutes to go from floor to floor for patch 1.22/Generations. 1.22elevatorveryfast.rar | Description: Elevator takes 1-3 sim minutes to go from floor to floor for patch 1.22/Generations. No Route Fail Tantrum Animations!